Design-Build Architectural Process - Kurt Krueger Architects, Inc.
Budget is a key component of any architectural development process. Setting the budget and staying on budget are probably two of the most important factors to overall client satisfaction with their new home. This is why we put budget front and center in our home design process. We’ve all heard those horror stories of projects where the budget balloons out of control and the homeowner is left with a bill 20, 40, 50% higher than expected. As a design-build firm, our in-house expertise in home design and construction is a crucial advantage for helping to set real-life cost estimates for the construction and systems required in your new home. The importance of this expertise can’t be overstated. Perhaps you’ve heard from other architects say that you won’t have your budget set until after the bid phase just prior to construction. When you’re design-build you don’t have to wait. Not only do you have the reassurance that the estimates are well thought out and substantiated, but you’re also saving time and money when working with a design-build firm because the typical bid phase of a project can take upwards of 7-9 months. When you work with a design-build firm, you skip this phase all together saving time and expense and you start out with more reliable estimates and numbers at the beginning of your project so that you can make any necessary refinements to the plan. From the very beginning of the project when we are first sitting down to discuss priorities and options, we’ll review what’s feasible on your proposed site with your budget. Once the design starts, we will set a preliminary schedule and budget based on up-front research. After the initial concept design is complete and approved by you, we’ll be able to prepare a near finalized budget. As we proceed into finalizing the design and then into the construction phase our team members are in constant contact reviewing and refining the budget. We’ve put in our architectural development process many milestone marks to ensure we are staying within budget. There’s nothing more rewarding than moving into your new custom home, but imagine how that joy is enhanced by the certainty that you stayed within your budget. Your project will begin in the Research phase. This is where you get inspired and dream. You are gathering information and playing around with ideas about how your luxury home will take shape. You may be reviewing property and establishing if you want to build new or renovate. 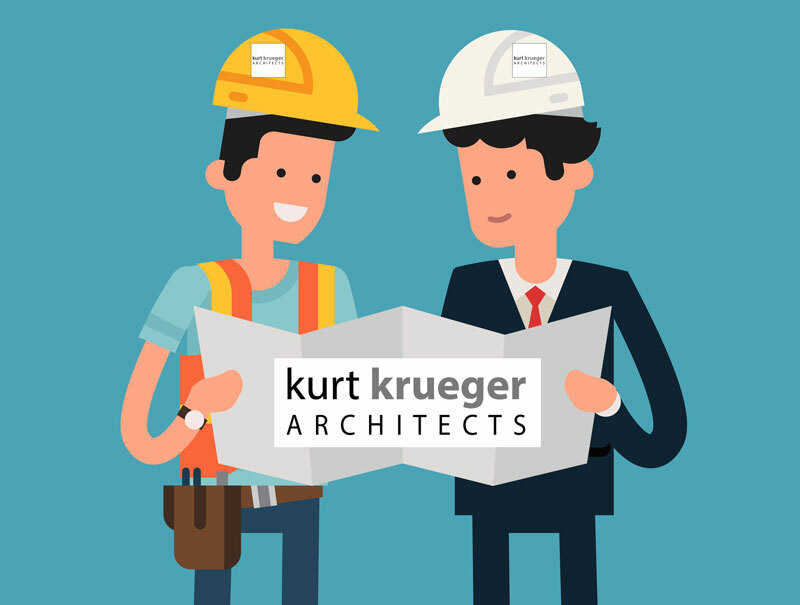 When you are ready to firm up your ideas, and before you purchase property, it is time to reach out to an architect like Kurt Krueger Architects and to make Introductions. Firms such as ours offer prospective clients a Consultation where we will review your goals and any specific parameters you have for your design. We will discuss your timeline, budget, and the proposed location. Architect and client also determine if they are a good fit for each other during this phase. The next step of the Site Visit is critical. The purpose is to assess the existing conditions to formulate a big picture plan including rough sizes and square footage and to determine if the property will meet your needs (and if the property should be purchased). This allows us to focuses on creating designs for your home that are not only beautiful, but that can be built on the selected site within budget while avoiding unnecessary compromises. During the Feasibility Analysis, we will research all zoning requirements and regulations including historic preservation ordinances and homeowner association guidelines. We will assist the owner in acquiring a site survey and a soils report. We will then determine a design plan and a more refined, but not finalized schedule and budget. This phase will determine if your goals can be achieved within your budget or what refinements need to be made. The Conceptual Design phase is when we begin to draw the preliminary design, including floor plans and views of the front and rear exterior. Based on the site visit and feasibility analysis we now know what the requirements are and what the restriction are and can work within these parameters to design and then build your luxury dream home. Designs are sketched out on paper by hand. The client then signs off on this concept and the budget is updated. After the concept is approved, we will take the design and develop it further by transferring it to the computer where we will create dimensions and scale. The look, form, and arrangement of the building will all be defined during Schematic Design. These plans will represent elevations, sections, and roof plans which will allow us to update the construction budget. This phase concludes with approved designs and a near finalized budget. With the plans finalized, we will explore all of the structural systems that will be needed during the build phase. We will engage consultants like structural engineers, mechanical, electrical and plumbing engineers, lighting, landscape, and interior designers to coordinate all plans and drawings as a part of the Design Development phase. The conclusion of this phase has us ready with documents to submit to the building authority for approval. We will also further refine the budget based on any new inputs. While the building authority is reviewing the plans submitted for permitting, we are standing by to be responsive to any comments and changes they may have. We are working a parallel track to further refine the submitted drawings into a set of Construction Documentation that will be used in the field. This full set of drawings will include material, hardware, and finishing selections. We conclude this phase by achieving the major milestone of setting the final budget before construction begins. Skip the bidding phase and move ahead to construction. As a design-build firm, we now have everything in place to begin construction. There’s no need to send out for bids, because the entire team is already in place and the budget has been complete. By skipping the lengthy bid phase (sometimes 6 to 8 months long), you save valuable time and can look forward to moving in sooner. During Construction, our focus is being on site to mange the project to ensure your dreams for your luxury home become a reality.